This chapter first introduces the bare, structural outline of the Dialectical Forge model (8.1). Individual components of this model are drawn forth and attached to the general outline in subsequent sections. 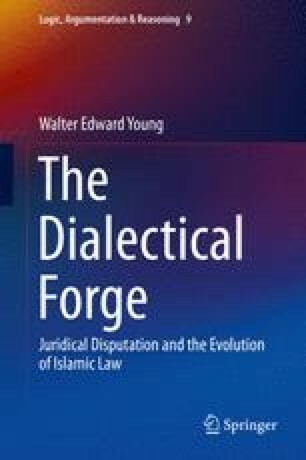 The development of uṣūl-theory in proto-system jadal is examined (8.2), followed by an overview of current paradigms for the evolution of uṣūl al-fiqh, tested for consonance or dissonance with this study’s conception of the dialectical forge (8.3), and a recap of the model’s uṣūl-theory components (8.4). Then the development of jadal-theory in proto-system jadal is examined (8.5), followed by a recap of the model’s jadal-theory components (8.6). The chapter closes with a presentation of the Dialectical Forge model in its most complete, if still provisional, form (8.7).